May 13, 2014, 11:41 a.m.
On April 14, nearly a month ago, well over two hundred young female students were kidnapped from a school in Nigeria by Islamist militants who go by the name of &apos;Boko Haram&apos;. The girls, who are Christians, were kidnapped in the north of the country which has seen significant upheaval in recent months and years as Boko Haram battle government forces. The kidnappings and the fight against Boko Haram had received comparatively little attention internationally, but as the crisis has dragged on – and attitudes in Nigeria towards the government began to sour – the focus has intensified. First Lady Michelle Obama gave a radio speech on Saturday drawing attention to the kidnappings and the US recently sent a small team of advisers to Nigeria to assist in the government&apos;s response to the crisis. According to YouGov&apos;s latest research, support for increased American involvement in the kidnapping crisis in Nigeria is high – much higher than support for greater American involvement in other ongoing crises around the world. 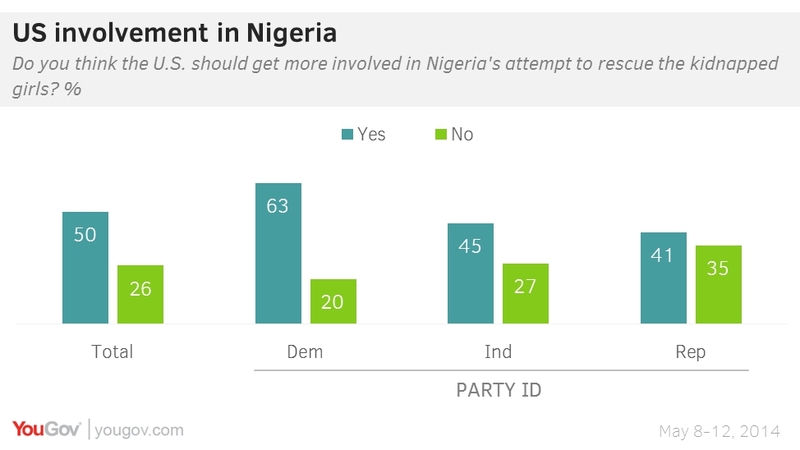 Half the public (50%) want greater US involvement in Nigeria, compared to 26% who oppose it. For every other crisis, including the Venezuelan protests and Russia&apos;s dispute with Ukraine, Americans tend to oppose greater US involvement, often by substantial margins. Support for involvement in the Nigerian kidnappings is greatest among Democrats. Nearly two-thirds (63%) of Democrats support greater US involvement in rescue efforts, compared to 41% of Republicans and 45% of Independents. Nevertheless, however, every group is more likely to support rather than oppose great US involvement in Nigeria. The survey also finds that people are split on whether or not the US media pays enough attention to what is going on in Africa. 35% say that the media pays too little attention, but 30% say that the media pays enough attention while 14% think that the media dedicates too much time to African news. The Nigerian kidnappings have benefitted from increased attention party due to a popular social media campaign, which makes use of the hashtag #BringBackOurGirls. Prominent public figures, including Michelle Obama, Hillary Clinton and UK Prime Minister David Cameron, have both publicy promoted the campaign. However, the involvement of the U.S. and other countries may be constrained by a reluctance in the Nigerian government to accept Western aid. Full poll results can be found here.